Let me start this post by stating that this is one of the happiest endings I have ever read in a novel before! Even though both Jane and Mr. Rochester have suffered immense tragedies and heartbreaks in their lifetimes, by the time Chapter 38 rolls around, our tortured lovers are finally, and forever, happy :) I believe a lot of that has to do with the way Jane finds happiness. She doesn’t chase after it, but rather, she lets her morals and her conscience guide her, and eventually happiness finds her, and it is better than if she had sought it out herself. On the far left we have Mr. Rochester: bold and extravagant “bachelor” who appears to be guided nearly exclusively by his feelings and emotions. He tosses conventionalities and morals aside after his wife inevitably succumbs to her madness. In his lifetime he has had several mistresses and at lasts falls in love with his “equal and likeness” (I just loved those lines), Jane. Tragically, this love affair is doomed from the beginning, and when Mr. Rochester’s attempt to commit polygamy is revealed, Jane flees despite Mr. Rochester’s tempting propositions of turning her into his mistress. On the far right we have St. John Rivers: religious fanatic who is guided completely by “reason, and not feeling” (Chapter 32). He denies himself a marriage of love in exchange for one solely based on duty and practicality, and he even tries to blackmail Jane into submitting to his beliefs as well. During the third act of the novel, St. John does behave in Christian-like ways (by taking Jane in, getting her back on her feet, and employing her), however, he also treats her with coldness and authoritativeness as opposed to brotherly love, all in a desire to mold her into the perfect missionary wife. Finally, smack dab in the middle we find Jane Eyre herself, who morally does what is right but who also never sacrifices her heart. (Now, I know that Jane confesses to us readers that she has never known what it is to be moderate, but I believe in the case between strictly following reason vs. strictly following feelings, she falls in the middle.) Throughout the novel, Jane fluctuates between emotional outbursts and fleeing from fleshly temptations, however, she lives by this motto: We need to always choose the path of the morally right, no matter how difficult. She looks to God and not to man regarding matters of conscience, and thus she is abundantly blessed because of all that she has overcome. Jane overcomes more obstacles, tragedies, sufferings than any other character in this novel. She is unwavering in her principles and morals, she is unwavering in her faith in God, and she is unwavering in her philosophy that all persons on earth are equals, despite differences in class, wealth, education, and other ranking systems. One of the themes that stuck out the most to me while reading Jane Eyre was actually quoted in a line by St. John: “He that overcometh shall inherit all things” (Chapter 35). I just love how beautifully this theme is woven throughout all of the occurrences in Jane’s life. Never once did she face something that was too difficult to overcome; never once was she beaten by temptation, failure, or injustice, and why was that? Because she was guided by moral purity, selflessness, forgiveness: Christian principles that Brontë comments on regularly throughout her novel. Another religious idea that Brontë discusses in this book is foreign missions. Jane and St. John’s characters are very similar in the idea that they both have a desire to serve others. However, they differ greatly in their opinions of how best to serve others. St. John essentially tells Jane that by not marrying him, she cannot become a foreign missionary, and thus she is denying God the ability to work through her. In his eyes, Jane was disobeying God. However, Jane has skills that she had already been using to help those even less fortunate than herself, and by the end of the novel we see how she will be able to serve another soul in need. I believe that Brontë implies that foreign missions are not a bad thing, they are simply not for everyone, and also, by not becoming a foreign missionary, it does not mean that one is “unusable” by God. Every country has a need, and every person can serve others, whether they stay in their home country or they go to another country. “I hold myself supremely blest–blest beyond what language can express; because I am my husband’s life as fully as he is mine. No woman was ever nearer to her mate than I am: ever more absolutely bone of his bone and flesh of his flesh. I know no weariness of my Edward’s society: he knows none of mine, any more than we each do of the pulsation of the heart that beats in our separate bosoms; consequently, we are ever together. To be together is for us to be at once as free as in solitude, as gay as in company. We talk, I believe, all day long: to talk to each other is but a more animated and an audible thinking. All my confidence is bestowed on him, all his confidence is devoted to me; we are precisely suited in character–perfect concord is the result” (Chapter 38). I should not have left him thus, he said, without any means of making my way: I should have told him my intention. I should have confided in him: he would never have forced me to be his mistress. Violent as he had seemed in his despair, he, in truth, loved me far too well and too tenderly to constitute himself my tyrant: he would have given me half his fortune, without demanding so much as a kiss in return, rather than I should have flung myself friendless on the wide world (Chapter 37). I absolutely loved so many parts of this last section, and in between the tears I was literally laughing out loud when Jane and Mr. Rochester returned to their old teasing ways. I’m sure I’m not alone in cracking up because of Mr. Rochester’s jealousy over St. John? I would quote the entire exchange between Jane and Mr. Rochester, when he is trying to uncover information about Jane’s cousin, only it is too long…but I was laughing to myself during that entire passage. Like I said in the beginning of this post: Jane Eyre has one of the happiest endings in any book I have ever read! And finally, one thing I really loved most about this novel was how everything came together: every single incident in this novel needed to happen for all the ones succeeding it to happen, and I thought Charlotte Brontë did a wonderful job as an author to make that seem effortless. I had heard only negative things about this film before I actually watched it, but fortunately I finished the novel beforehand, and I think that really aided me in liking this film. I was able to fill in gaps because there were a lot of things missing, especially regarding characters’ qualities. Pros: The acting was superb; the cinematography was beautiful; I loved the music; the script was well-written; I loved the way this film was edited–one of my favorite parts was when the Rivers ask Jane for her name and we hear John Reed creepily call out, “Jane Eyyrreee…” before it flashes back to Jane’s childhood. Cons: Mr. Rochester seems controlling and possessive, his sarcasm is more dark than it is witty; Bertha is practically cut out of the story; they leave out the best parts about the ending! It feels like a happy ending, but not entirely. This was probably my favorite adaptation, mainly because Mr. Rochester was just like Mr. Rochester in the book. This miniseries was very true to the novel, and only a few things were cut out or changed, some better than others. Pros: Rochester is wonderfully portrayed–he’s sarcastic and witty to the point I was laughing out loud several times during his scenes, especially when Jane makes him jealous at the end! (the scene pictured here); the costumes were BEAUTIFUL; I loved the way they adapted the gypsy scene. This was probably my least favorite adaptation out of the four that I watched. I don’t even remember much about it, to be honest, and I think that is because nothing really stood out, although there were some good parts. Pros: I liked the actress playing Jane–she wasn’t an amazing actress or anything, but I did like her; I also liked the actress playing Mrs. Fairfax. 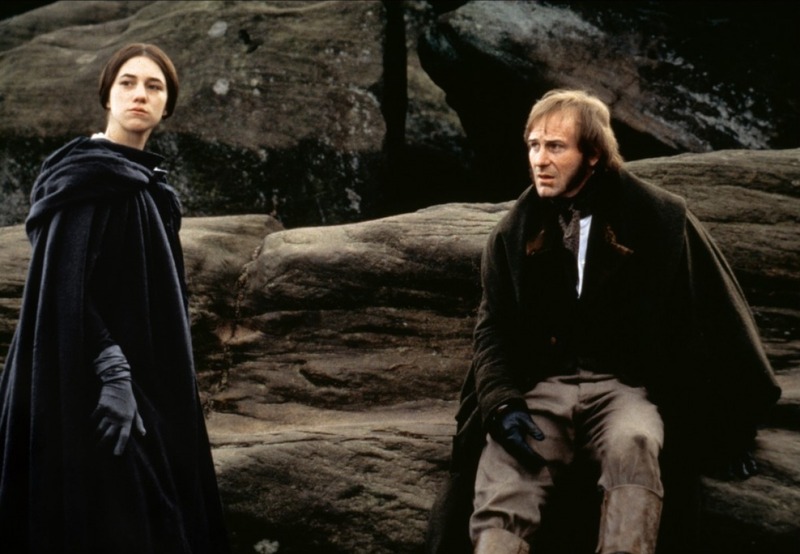 Cons: I did not like the portrayal of Mr. Rochester–although he was still proud and sarcastic, he seemed too nice at the same time; the ending was changed from the novel a little bit to my disliking. I loved this version, and it might have something to do with the fact that I have had a crush on Timothy Dalton since I was a little girl (I know…he’s like 70 years old now, but he was in an older version of Antony and Cleopatra that I watched at my grandma’s house one summer growing up and yeah…he’s pretty handsome). Pros: Timothy Dalton is a fantastic actor–he’s does a wonderful job at portraying Mr. Rochester’s changeable behavior; this adaptation follows the novel very well, they even do the gypsy scene with Timothy Dalton dressed as an old lady! Finally! 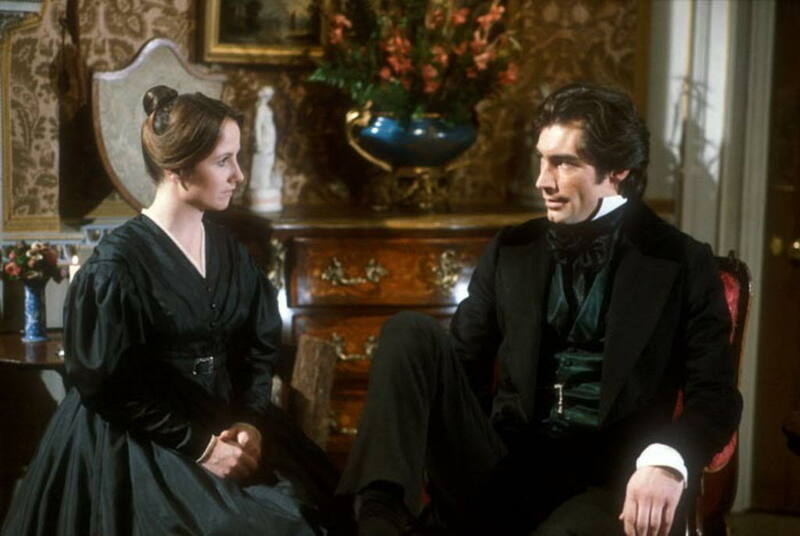 Cons: like I said before, Timothy Dalton is handsome–too handsome to be Mr. Rochester; Jane’s character is missing some “Janeness” (she’s not as firm; also, some general film problems: the lighting is not good (lots of shadows), and the sound is off at times. Also, at Lowood they ring the bell for way too long, I was wanting to mute the volume! I’m so glad I’m not alone in thinking Timothy Dalton is “ridiculously attractive!” Also, I’ve noticed that you have been writing about movie adaptations recently :) I love comparing them to the original stories too. Super recap! Your “Jane Eyre Spectrum of Human Intention” is awesome and I love how you tie back “He that overcometh shall inherit all things” (one of my favorite verses) to Jane’s life, from its beginning to her finding happiness with Rochester. One of the things that got me really upset with St John is that he tried to limit God’s working through Jane, like it was the mission field (as his wife!) only or nothing. Silly man! And thanks for the recap on the adaptations. Now I’ll have to search out all of them! As someone who also had a crush on Timothy Dalton I do not thank you for reminding me of his age (which is 69 … I checked :P). I love this post. I’m going to follow your blog just because, wow, this may be the best post on Jane Eyre I’ve ever read. And it’s my favorite book of all time, so I’ve read quite a lot about it. Thank you. Wow! Thank you so much :) it was my first time reading it but I ADORED it! And I’m heading over now to check out your blog as well!